SCRIP FUNDRAISING ... a great way to help SPL! The purpose of scrip fundraising is to raise funds while you shop! 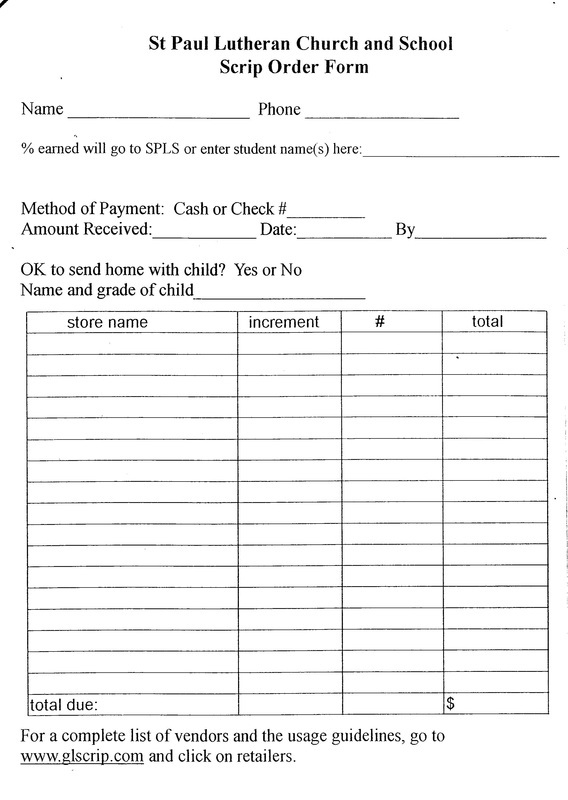 Raise money for St. Paul Lutheran School (or a specific family in our school) just by making purchases with scrip gift cards. You raise money from your everyday purchases like gas and groceries. Buy scrip gift cards and you receive the full value of what you paid. You also earn an immediate rebate percentage of what you spend - typically between 3% and 15%, depending on the retailer. Use the proceeds to supplement the school budget, or families can receive credit toward tuition expenses. Order packets available in the Welcome Center or in the school hallway when scrip table is present between Sunday services. To shop online, go to shopwithscrip.com. You will need the enrollment code first, which is available from the church or school office, or contact Joan Abel. it gets closer to the new school year. For a list of complete retailers, go to ​https://shop.shopwithscrip.com/Shop/Product/Browse or download files below (alphabetical or by category). For the most current listing, go to link above. ​HY-VEE & FAREWAY RECEIPTS Save your Fairmont Hy-Vee and Fareway receipts – turn in to the collection bins located in the upstairs school corridor and church basement. 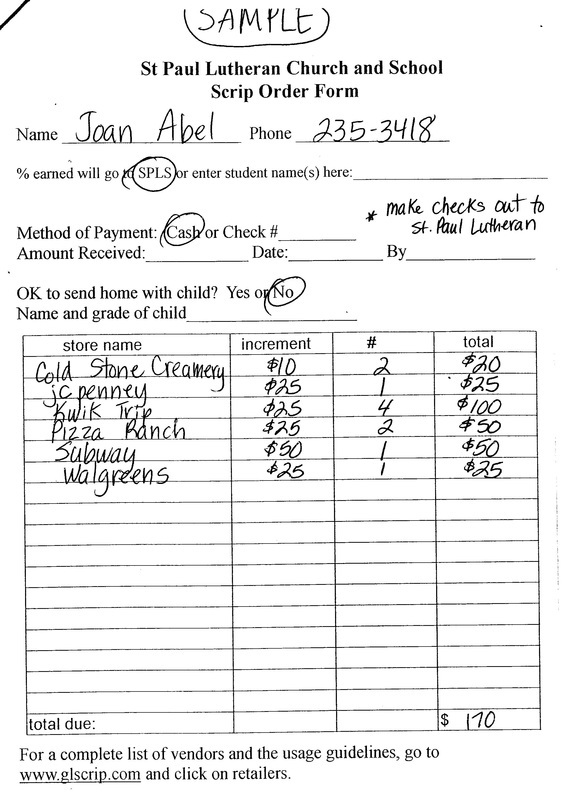 For each $150,000 in receipts collected from their store, they donate $1,000 to St. Paul Lutheran School. Receipts must be from Fairmont stores only. KWIK TRIP SCRIP GIFT CARDS Gift cards are available for purchase in the school or church offices. SPL School receives a percentage of all purchases made with these gift cards at the gas pump and inside the store. Available in $10 to $100 denominations. SUBWAY CARDS If you purchase Subway cards, 2% of your purchase can go to SPLS. If you already have a card or when you purchase one, add our school’s code (3TQF) to your card at www.subway.com or call 1-800-564-1343. Subway cards can be purchased at any Subway and are redeemed at full purchase price when you eat at Subway. OTHER PROGRAMS Save Box Tops for Education, Tyson “Project A+ labels; and Pizza Ranch “wagon” symbols. We also collect used, workable cell phones. WE ALSO APPRECIATE YOUR SUPPORT of our other school fundraisers, such as the Silent & Live Basket Auction and the Tour of Tables & Cake Walk. WE NO LONGER PARTICIPATE in the SchoolMall program. Also, all UPCs with the Labels for Education program must be submitted to the school no later than Friday, December 15th, and the Labels for Education program is coming to a close. THE SCHOOL ALSO collects aluminum pop tabs to help support the Ronald McDonald House in the Twin Cities. Families receiving care at any Twin Cities area hospital are eligible to stay there, provided their children are being treated for cancer or have other life-threatening illnesses and the family resides 45 miles or greater from the Twin Cities. Yearly, more than 600 families stay there.